Katima Mulilo can be considered the frontier town of the Caprivi region, offering travelers a host of accommodation options and supplies for traversing deeper into Africa. The name means "quenches the fire" in SiLozi, referring to the nearby Mbova Rapids of the Zambezi River. It acts as a hub with roads leading in all directions to world famous destinations, stunning sceneries and national parks. With an average annual rainfall 654mm, the town is not only home to different cultures, but is also frequented by an abundant array of bird species and monkeys. The Katima Supermarket, the Ngwezi bottle stall and the Ngwezi Post Office all form part of the character of the town. Katima Mulilo is rich in cultural diversity with as many as seven languages spoken. The Caprivi Art Centre is a must and the annual Caprivi Cultural Festival attracts many local artists and visitors. Regular flights from the capital city Windhoek keeps Katima Mulilo in touch with the rest of the country. 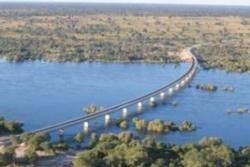 With the completion of the Sesheke Bridge over the Zambezi River, the town is now also linked directly with Zambia.